Structure-based truck load silos are designed for the storage and later dispatch of bulk products such as granulates, flour, etc. 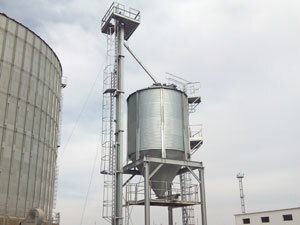 For agricultural facilities, feed plants or flour plants, the silos available range from 2.55 m in diameter to 4.58 m with capacities ranging from 11 m3 to 200 m3. For industrial facilities with silos for truck or rail dispatch, we recommend silos with a diameter of at least 4.58 m and capacities ranging from 80 m3 to 400 m3, upon request. Built in Z600 quality galvanised steel with high mechanical and corrosion resistance. Galvanised external reinforcements, regardless of their thickness, for an effective anticorrosive performance. We design and manufacture other types of galvanised and bolted structures. Galvanised and bolted structures, with leading technology, to provide an easy and fast assembly. We design and manufacture another types of galvanised and bolted structures. 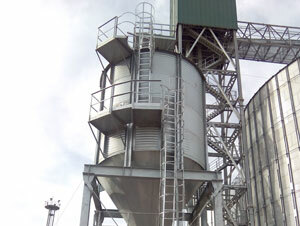 We design and manufacture bulk silos with support structures for truck or train drive-thru. This structure is made up of rigid bare double-T laminate profiles built in S275JR hot-dip galvanised steel. 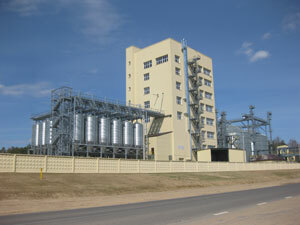 The standard silo to ground outlet height is 4500 mm with the possibility of adapting to the customer’s needs. Available in different matrices from an independent silo to matrices in different arrangements to meet the needs of your facility and with the option of adding a maintenance platform and access to the silo unloading outlet. As an option, we offer the possibility of a lateral and top closure as well as adding a load cell weighing system on the structure.